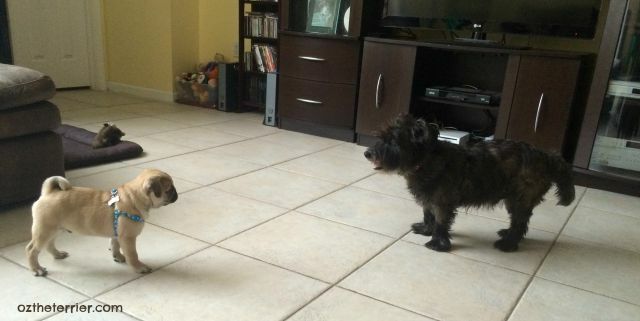 My cousin Louie the little Pug is staying with us for a whole week while his parents are on vacation. We met for the first time on Monday and became fast friends. 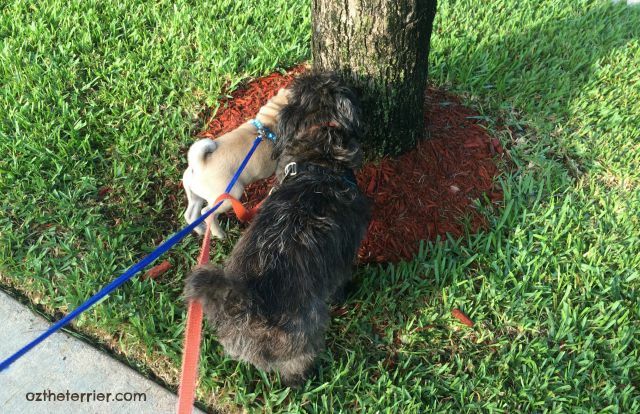 I am teaching him how to sniff trees properly while we are on walks around the neighborhood. I am even letting him play with whatever toy he wants. He has taken a real liking to my Kathy Ireland Crinkle and Chew Bunny toy. Actually, I think this toy is perfect for a puppy because the crinkle noise encourages chewing so now Louie chews on the toy instead of Daddy-dog's shoes! Don't forget my giveaway where you could win a Kathy Ireland Loved Ones toy. I am giving away the Durable Blue Whale with Squeaker and Treat Pocket and the Durable Pink Bear. You can go HERE to enter if you haven't already. In regards to my Crinkle and Chew Bunny, I think I will send it home with Louie when he leaves next week. He really loves that toy so it will be my gift to him. Oh he's adorable!!!! And you were the pawfect host Oz! 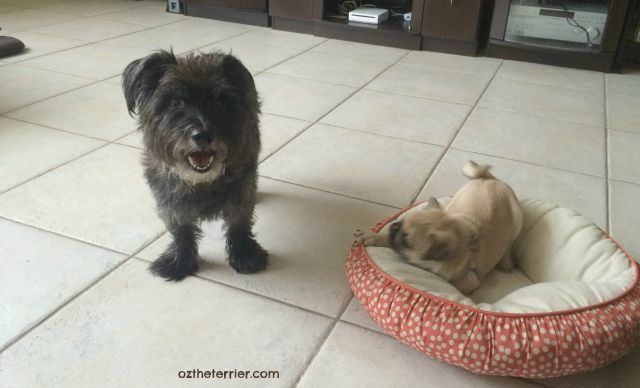 Good for you to be such a sharing and caring friend Oz! Are you learning anything from him? OMG I LOVE HIM!! He is soooooooooo adorable! Is he a puppy? I just want to pick him up and kiss him! What a little cutie! Bet it's fun to have a little pal around. Wow, he makes you look big! So nice that you are giving him pressies! What a great cousin you are!! we hardly share our toys with each other!! 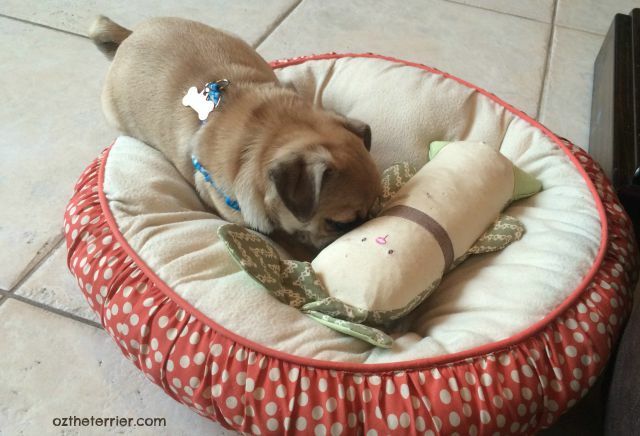 Louie is adorable and is so lucky to have you showing him da ropes and cool toys. So what you're saying is you have a lot of patience and tolerance.......can I send Judd to your house? louie is too cute and you are a super cousin! What a nice host you are, Oz. And a very generous cousin to send your toy with your guest. Oh he is one cute little boy!!! He must be really small, since you are small and he looks much smaller than you! Oh, that's so sweet you're going to let Louie take the toy home, Oz. You are a very good cousin to be sharing your home and everything else with him. He is a little cutie, and we mean little! He is SO cute! I'm a sucker for Pugs. Louie sure is a cutie. We bet you sleep well every night. He are a cute lil guy! Awwwwwwe! You are the sweetest doggie cousin EVERS Oz!!! Louie is such a cutie-patoooootie!!! And I am glads you are showin' him the ropes on how to be a pawsome doggie furiend! I know you will do a fine job teaching Louie so many things. I bet you are a good teacher! Awwwww how cute is that?! Louie looks like a lovely playmate, and he is so lucky to have you looking out for him Oz. That's a big responsibility to teach a puppy about life Oz but I know you'll do a great job! Looks like you are having fun! Louie is really little isn't he?